In January, MTV will be bringing The Shannara Chronicles to the TV screen. For those of you unfamiliar with the source material, the series springs from the books of Terry Brooks. Back before Young Adult was a thing, Terry Brooks' writing fit nicely into the space that YA would come to fill. His was a world inspired by Tolkein but also set in a distant future after the world had fallen apart. The trailer above makes that more explicit than the books tend to - check out those real-world locations or objects like that grand-looking wreck of a ship, now decaying and part of a fantasy landscape filled with swords and monsters. One of the interesting gulfs the series will have to bridge with the books is that Brooks has written his series with generational gaps in between. Descendants pick up the mantle of their forebearers as the fantasy saga continues, so it will be intriguing to see how - or if - the series handles that once it has established faces in recognised roles. 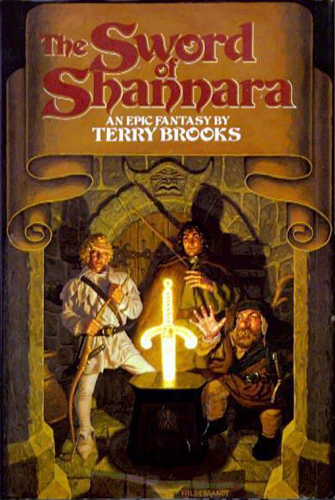 As a teenager, the first book of the series I read was The Sword of Shannara. Back then, there used to be little brochures coming around schools with books that children might be interested in. These were brochures filled with things like The Machinegunners or The Warlock Of Firetop Mountain. And there, nestled amongst the books on offer, was The Sword of Shannara. For the teenage me, it was a great read, as Shea Ohmsford seeks out the Sword of Shannara and bids to defeat the Warlock Lord. So far, so generic, right? But the future setting adds a layer of shadow to it, along with the lingering effects of a nuclear war. Mixing the two provided a potent atmosphere, and a science fiction dystopia long before such things were another tick on the checklist of YA novels. Is Sword of Shannara derivative of Tolkein at times? Sure it is, but there are far worse things to be derivative of - and it was largely written when the author was young. He's since grown the series substantially, and hit the New York Times bestseller list over and over again. But if I were to tell anyone where to start with the series, it's still here. It's the seed from which the rest of the saga - the rest of the Chronicles - flower. And it's coming to TV in January. I'll be watching.